It’s a good job the first two tests are back-to-back as cricket message boards across the web were chocker full of over-analysis in the aftermath of Monday’s drawn test. Most of the discussion, in particular in Cricket Web’s Ashes Forum, centred around wondering which side had the momentum following the game. Was it England after easing their way to 517-1, was it Australia after showing they could get England out cheaply, or indeed after Ponting’s impressive innings in the dying overs? Valid points can be made either way so we won’t dwell; if you haven’t got an opinion on that it’s probably for the best, and in a few hours time it won’t matter anyway. However, a development over the last couple of days has surely swung the psychological edge England’s way. That is, of course, the dropping of the eratic Mitchell Johnson, hotly rumoured yesterday and confirmed earlier in the day (English day, that is, it all gets very confusing with these timezones doesn’t it?). I don’t think anybody who watched Johnson bowl during the Gabba test can be under any illusions that the dropping was wholeheartedly deserved. 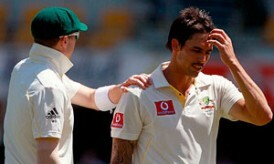 The Queenslander channelled his inner-Harmison to produce some of the most bafflingly atrocious bowling of the HD age. On top of that was a nineteen-ball duck and an attempt at a catch, from which one could only summise he had just washed his hands with vegetable oil. So upon reading my synopsis of his performance, you are well entitled to be asking yourself how on earth I figure that his removal from the Australian XI gives England any sort of edge. Surely the further away from the pitch this joker is, the better it is for the Australians? Well, yes and no. If Johnson played all five tests, and did so to the level he performed at in Brisbane, then England would have been looking forward to a nice celebration upon arriving home in January. I won’t pretend, that as an ardent England supporter, I wasn’t pleased to see Bollinger’s name missing from the Australian teamsheet last Wednesday night, and that, I imagine, will be addressed tonight. The thing is, though, that in the lead-up to this series I couldn’t help but think how much Australia’s selectorial uncertainties were a very English quality; it’s no co-incidence that England’s only Ashes triumphs in a generation have come on the back of stable sides. Australia went into this series with question marks all over their eleven, and now after one Test their selectors have basically admitted they have no idea what they are doing. Ricky Ponting’s statement that he wants Johnson to work hard in the next week or so to get himself ready for the final three tests solidifies this – Australia are all over the place. Johnson was their premier bowler and he got the axe. Peter Siddle, well he should be safe after his first innings performance in Brisbane, but eight days ago nobody wanted him in the side. There are calls for the head of Ben Hilfenhaus and Xavier Doherty was hardly convincing. It is not inconceivable to predict that no Australian bowlers will play all five tests. The batting, on the other hand, seems set in the eyes of the selectors. I wonder if you asked the home fans on their way in later if they agree with that policy. Back on Johnson, though, as much as I criticised his performance last week, and last summer in England, there is definitely something taken away from Australia without him in the side. He is Australia’s biggest liability at times, but if he gets going he is their deadliest weapon. It’s a big if, sure, but is it a risk worth taking? To refer back to my earlier comment, well I stuck by Harmison. If he wasn’t there, you’d know deep down it was for the best but at the same time long for what he could – seldom, rarely, infrequently – bring to the table. When he was there, he’d infuriate us all, but you couldn’t help but think, he’ll come good. Remember Jamaica 04! Old Trafford 06! And Johnson, well he had his Perth 08, his Durban 09. Of course, for all the ferocity of that spell in Durban, Johnson finished the match with 4-115, three of those wickets coming in the first innings. Maybe on that day he was channeling Flintoff instead. The most important thing to come from Johnson’s axing is definitely the uncertainty at the Australian selection table. Nonetheless, if Australia click and sort England’s batsmen out in Adelaide, then it will all be irrelevant and they will have addressed their early mistakes. Right now though, you fancy that Andrew Strauss will be feeling confident.